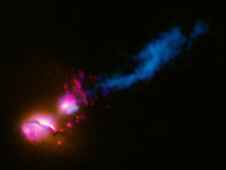 Jets from super massive black holes produce high amounts of radiation, especially high-energy X-rays and gamma-rays, which can be lethal in large quantities. The combined effects of this radiation and particles traveling at almost the speed of light could severely damage the atmospheres of planets lying in the path of the jet. For example, protective layers of ozone in the upper atmosphere of planets could be destroyed.